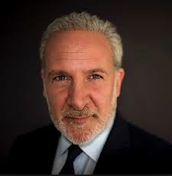 Peter Schiff On The Markets: The Forex Markets Are Ignoring The Darkening Economic Picture Of The U.S. The Forex Markets Are Ignoring The Darkening Economic Picture Of The U.S. The foreign exchange markets continue to ignore the darkening economic picture of the United States. The dollar enjoyed, I think, one of its best weekly gains in years, in fact it is the best 2 week gain for the U.S. Dollar Index since the financial crisis of 2008. Well, you know, we can ignore all this bad economic data because we got the jobs report. The jobs report is strong, and so therefore the economy must be strong and we can ignore all the economic data that suggests that the economy is weak. Because after all the jobs report says it is strong. Well, it seems to be, and I have said this before, that the jobs number looks like the outlier. When all the other data says White, and the jobs report says Black , why is that people are not questioning the validity of the jobs data?